This was a difficult one because, although I am a frequent re-reader, I can’t be sure I’ve ever reread a book four times or more. Many books I have read three times, but I usually like to let some time pass before I return to the same story. However, there is one book from my childhood that was an absolute favorite. I am reasonably sure I read it at least three times, and likely more. And, surprisingly, it’s not fantasy! 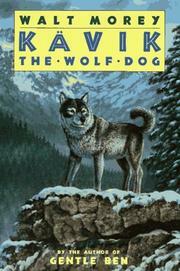 Rather, it is Kävik the Wolf Dog, by Walt Morey. This is one of those Alaskan canine survival books in the tradition of Jack London, written for boys with a taste for adventure and the cold bite of the North American wildernesses. I was probably between third and fifth grade when I first encountered it. The genre was my favorite at the time, bringing me such modest gems as Wolfling by Sterling North, Stone Fox by John Reynolds Gardiner, and Hatchet by Brian Paulsen (which, sadly, lacked a wolf or dog hero). And of course Jack London’s Call of the Wild and White Fang, easily the most brutal of the books I read. But my favorite was always Kävik the Wolf Dog. What did I love about these books? The wildness of nature in them, for one thing. Clean, crisp air, snowy mountains, thick forests with only the toughest humans and animals trekking through them. Freedom, too, because Alaska in these books feels like an untamed frontier. And the wolves. I love wolves. They’ve always been my favorite animal, because of their beauty, dignity, and danger. The fact that their pack is so important to them. Nobility, and sometimes even a kind of chivalry, existed in the natures of these perfect hunters, as depicted in the books I read. The book has two heroes, really. Kävik is half wolf, half malamute, trained by a harsh master to be a lead sled dog strong enough to win the North American Sled Dog Derby at Fairbanks. He also is trained to violently keep his team in check, and kills a number of other dogs in vicious fights. After winning the race, Charlie One Eye sells him to a rich businessman, who then flies him back to his mansion in the States, hoping to make a house dog out of him and show him off to friends. The plane crashes in the snow, and the nearly-dead Kävik is found by young Andy Evans, the book’s other hero. Over a few months the wolf-dog recovers, and during that time Andy forms a friendship with him. The crash has mellowed Kävik’s killer instinct greatly – in fact, it knocked his courage right out of him. But eventually Kävik’s rightful owner comes back to claim him, and takes him 2000 miles away from the boy he loves. That’s when the real story begins. Kävik escapes his plush new home and braves 2000 miles of tough country to get back to Andy, the only human to be kind to him. He fights lynxes and bobcats, wolves and dogs. He navigates strange towns, evades dogcatchers, and finds ways to cross bodies of water. And he recovers his wolflike courage and fighting spirit, while retaining the sense of gentleness and honor that Andy taught him. Man, I’d forgotten how much I used to love this book! I think I’ll give it to my nephews, so they can grow up with it, too.